Space came just a little bit closer for the everyman this week, as Virgin Galactic's ship made one 1,470kph-leap towards space in its first successful flying rocket test. If that wasn't enough, we've also seen the beautiful, but incredibly deadly, storms at Saturn's north pole for the first time, and found a potential cure for diabetes. All that and more in another exciting Week in Science. SpaceShipTwo breaks the sound barrier -- Things in the space tourism industry just got interesting. 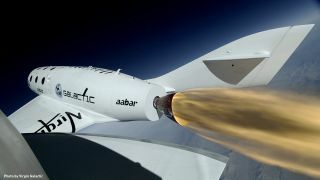 In its first proper rocket-powered test flight, Virgin Galactic's SpaceShipTwo underwent a 16-second burn propelling it to an altitude of 16.7km at some 1,470kph, just bre'aking the sound barrier, before making a smooth and controlled landing. According to Virgin's Richard Branson, the successful test clears the way for the very real goal of suborbital, edge-of-space tourist trips before the year is out. New liver hormone might 'cure' diabetes -- Diabetes is one of the biggest problems of modern developed-world life. Both sugar-rich diets and old age bring with it risk of developing diabetes and being stuck injecting insulin for the rest of your life. Now a new hormone found in the liver could be a cure, as it has the ability to spur growth of insulin-secreting cells in the pancreas. Smoking shisha is much, much worse than cigarettes -- Smoking flavoured tobacco and fruit mixtures through water pipes has become commonplace in certain types of bars across the UK and US. Stemming back 100s of years ago in India, the Middle East and North Africa, the tradition of smoking through water pipes is often thought of as safe.